Introduction: The discovery of a molecular marker able to predict malignant transformation of thyroid lesions would be of up most importance in clinical practice. E-cadherin inactivation is an early event observed in many cancerous epithelial lesions. Objective: To verify the possible role of the E-cadherin gene methylation in malignant transformation of the thyroid tissue. Method: The methylation of the E-cadherin gene was assessed by MS-PCR after DNA extraction by using sodiumbisulphate technique. The leukemia-MV411 and BV173 cell lines were used as positive controls. Ten samples of peripheral blood, normal thyroid tissue, and papillary thyroid carcinomas were tested. 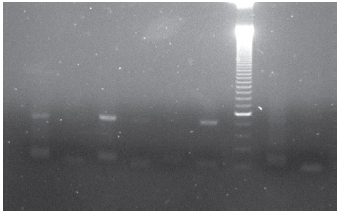 Results: MV411 and BV173 cell lines showed only methylated pattern. All the samples of peripheral blood, normal thyroid tissue or papillary carcinomas showed only non-methylated pattern. Conclusion: These data suggest that the lack of methylated pattern for both normal thyroid tissue and papillary carcinomas indicates that methylation of the E-cadherin has no significance in thyroid papillary carcinogenesis. The reduced expression of the components of the cadherin-catenin cell adhesion complex seems to imply an invasive behavior in several human neoplasms. In the normal epithelial tissue, E-cadherin - a transmembrane glycoprotein of the cadherin super family - is expressed on the basocellular surface of epithelial cells, more specifically in the cell-cell adhesion junction (1). The cytoplasmic domain of cadherins interacts with the proteins of the catenin family members. Both b-catenin and g-catenin bind to a-catenin-cadherin complexes linked to the cytoskeleton. Such a complex functions as an intercellular anchorage, allowing epithelial cell arrangement to occur optimally (2). Reduced expression, absence or even abnormal localization of E-cadherin have been described in various types of carcinoma of stomach, skin, bladder, breast, and colon (3). Certainly, aberrations involving the E-cadherin gene are very important in the carcinogenesis. More than 70% of individuals carrying germline mutations in the Ecadherin gene (CDH1 gene) eventually develop gastric cancer (4). Differently of the hereditary cases, sporadic cases involving changes in the E-cadherin expression rarely show irreversible anomalies in the E-cadherin gene. Virtually all of these abnormalities correspond to changes in gene transcription, and most of them are secondary to hypermethylation of the gene's promoter region (5,6,7). If low levels of E-Cadherin are frequently encountered in epithelial malignancies of the gastrointestinal tract, this is not universally true for adenocarcinomas of other sites. Thyroid malignancies display different levels of E-cadherin expression and this distinct expression level seems to be related to different histological types (5,7,8). Low levels of E-cadherin expression have been described for papillary carcinoma, however such a phenomenon seems to be less common for both follicular and anaplastic ones (9,10,11). All cases of anaplastic carcinoma involving the thyroid virtually have E-cadherin reduced expression. Histologically, the reduced expression of the E-cadherin seems to be a phenomenon resulting from the reverse process in which more differentiated tissues acquire anaplastic characteristics (12). Papillary carcinoma of the thyroid is the most common variant of the thyroid cancer, and is characterized by an indolent clinical course. The variable expression of the Ecadherin within this subtype of thyroid cancer seems to be associated with the activation of the ret/PTC-1, which is also found to be activated in cases of Hashimoto's thyroiditis, thus suggesting that certain lesions could precede the cancer itself through a very peculiar pathway, involving both c-ret gene and the reduction of the E-cadherin expression (9). E-cadherin abnormal expression in Hashimoto's thyroiditis prompted us to analyses whether methylation of the E-cadherin is a frequent phenomenon in other nonmalignant lesions of either thyroid or normal tissue. The few studies of papillary carcinoma evaluated E-cadherin expression by either immunohistochemical essays or qualitative/quantitative mRNA analysis. Studies of the methylation status of E-cadherin gene in patients with papillary thyroid cancer have not been described so far. Therefore, we sought to determine the methylation status of the E-cadherin gene based on a series of cases of goiter and papillary carcinoma as well as samples of normal thyroid tissue. Fifteen patients presenting with thyroid nodules who had been submitted to surgery in 2001 at the Sírio Libanês Hospital were included in this study, ten of them with papillary carcinoma and 5 with goiter. This project has been done in accordance with the Research Ethics Committee approval number 2001/02. E-cadherin methylation status was evaluated by MSPCR technique according to protocol described by Herman (13). The phases of alkaline denaturation, deamination, and sulfonation were performed according to the same protocol cited above. In the phases of DNA purification and desulfonation, the Wizard® DNA Clean-Up System kit (Promega) was used with primers for non-methylated Ecadherin. Precipitation was performed in dry ice for 15 minutes, and amplification reactions were achieved with 1.5 ?l of MgCl2 in a final reaction volume of 25 ?l under ressociation and stretching temperatures, respectively, of 57oC and 72oC for 4 minutes. Genomic DNA from human peripheral blood was used as a reaction positive control for non-methylated Ecadherin, whereas genomic DNA from leukaemia cell lines (BV-173, REH, MV-411) was used as a positive control for methylated E-cadherin (Figure 1). Figure 1. 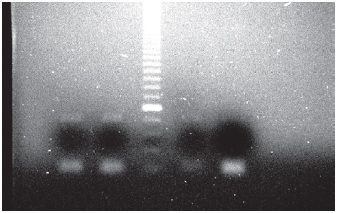 Gel showing methylated pattern of the E-cadherin gene. In the two first columns, leukaemia MV411 and BV173 cell lines were, respectively, tested; in the third column, molecular weight marker of 50 pb; in the fourth column, REH cell line; and in the fifth column, reaction positive control. Samples of nodules and adjacent normal thyroid were obtained from 3 males and 12 females, whose age ranged between 28 and 63 years old (mean 43 years). All the samples of peripheral blood, normal thyroid tissue, goiter, and papillary carcinomas showed exclusively nonmethylated pattern in contrast with the leukaemia cell lines MVR411 and BV173, which produced a consistent methylated pattern (Figure 2). Figure 2. Gel showing both non-methylated and methylated patterns of the E-cadherin gene. In columns 1 and 2, papillary carcinoma sample was tested (non-methylated and methylated patterns, respectively); in columns 3 and 4, peripheral blood (non-methylated and methylated patterns, respectively); in columns 5 and 6, leukaemia BV173 cell line (non-methylated and methylated patterns, respectively); in the column 7, molecular weight marker of 50 pb. The silencing of E-cadherin gene is a frequent event in human cancer and is generally caused by aberrant CpG island methylation of the gene's promoter region. In thyroid cancer, inhibition of E-cadherin expression is frequently seen in anaplastic tumors and, less commonly, in papillary tumors. As gene methylation can be easily assessed in small size specimens, its detection, if clearly associated with cancer, could be of clinical use for diagnostic decisions. Thyroid nodules have a prevalence of 4-7% in the general population and are usually diagnosed by fine needle aspiration biopsy (FNAB) (14). Although FNAB is the usual procedure for histological diagnosis, the results are frequently inconclusive because of factors such as pathologist's experience, quality of the extracted sample, presence of hemorrhage or colloidal material (15). All the cases of doubtful diagnosis regarding either malignant or non-malignant nodules have encouraged the search for biological markers having specific relationship with malignant transformation and whose analysis can be carried with scant material. In the present study, methylation analysis of the E-cadherin gene promoter - a potential maker candidate for thyroid cancer - was shown to be ineffective for identifying papillary carcinomas. As the E-cadherin expression is, in fact, considerably reduced in those cases of papillary carcinoma of the thyroid, the most common mechanism of episomal gene inactivation (i. e. methylation) is not actually used, and probably some other biological abnormality following translation is involved in these tumors. Indeed, E-cadherin expression was recently analyzed as a part of a cDNA micro array study of papillary thyroid carcinoma (11). E-cadherin expression was found to be diminished in some cases and such a reduction was related to a high level of P-cadherin - different type of cadherin, thus suggesting a possible switch involving these both cadherin family members in certain cases of papillary thyroid cancer. Anaplastic cancers characteristically display low expression of E-cadherin at protein level (12). It would be very interesting to understand whether E-cadherin under expression could be related to methylation. If so, one could postulate that both anaplastic and papillary thyroid cancers use different carcinogenetic pathways. In fact, these two types of tumors seem to be very different in terms of progression and epidemiological distribution. Apparently, a proportion of the patients with anaplastic cancers come from countries where goiter is common and the anaplastic cancer has probably arisen from a differentiated lesion which had not been diagnosed for a long time. In some cases, there is a spectrum ranging from papillary cancers to anaplastic ones, thus indicating that the latter originate from more differentiated lesions (16). In summary, the lack of E-cadherin gene methylation in the papillary thyroid cancer population indicates that such a mechanism of gene inactivation is very rare. This is surprising since methylation responds in almost all cases of human tumors having reduced expression of E-cadherin. Further studies into E-cadherin pathway regarding these tumors are needed. The authors would like to thank Hospital Sírio Libanês and the research scientists of the molecular genetics laboratory for technical assistance. 1. Boller K, Vestweber D, Kemler R. Cell adhesion molecule uvomorulin is localized in the intermediate junctions of adult intestinal epithelial cells. J Cell Biol. 1985, 100:327-332. 2. Ben Ze'Ev A, Geiger B. Differential molecular interactions of beta-catenin and plakoglobin in adhesion, signalling and cancer. Curr Opin Cell Biol. 1998, 10:629-639. 3. Bondi J, Bukholm G, Nesland JM, Bakka A, Bukholm IRK. An increase in the number of adhesion proteins with altered expression is associated with an increase risk of cancer death for colon carcinoma patients. Int J Colorectal Dis. 2006, 21:231-237. 4. Huntsman DG, Carneiro F, Lewis FR, Macleod PM, Hayashi A, Monaghan KG, Maung R, Seruca R, Jackson CE, Caldas C. Early gastric cancer in young asymptomatic carriers of germline E-cadherin mutations. N Engl J Med. 2001, 344:1904-1909. 5. Kato N, Tsuchiya T, Tamura G, Motoyama T. E-cadherin expression in follicular carcinoma of the thyroid. Pathology International. 2002, 52:13-18. 6. Rocha AS, Soares P, Fonseca E, Cameselle-Teijeiro J, Oliveira MC, Sobrinho-Simoes M. E-cadherin loss rather then beta-catetin alterations is a common feature of poorly differentiated thyroid carcinomas. Histopathology. 2003, 42:580-587. 7. Soares P, Berx G, Van Roy F, Sobrinho-Simoes M. Ecadherin gene alterations are rare events in thyroid tumors. Int J Cancer. 1997, 70:32-38. 8. Graff JR, Greenberg VE, Herman JG, Westra WH, Boghaert ER, Ain KB, Saji M, Zeiger MA, Zimmer SG, Baylin SB. Distinct patterns of E-cadherin CpG island methylation in papillary, follicular, hurthle's cell, and poorly differentiated human thyroid carcinoma. Cancer Resp. 1998, 58:2063-2066. 9. Smyth P, Sheils O, Finn S, Martin C, O'leary J, Sweeney EC. Realtime quantitative analysis of E-cadherin expression in ret/PTC-1 activated thyroid neoplasms. Int J Surg Pathol. 2001, 9:265-272. 10. Aratake Y, Nomura H, Kotani T, Marutsuka K, Kobayashi K, Kuma K, Miyauchi A, Okayama A, Tamura K. Coexistent anaplastic and differentiated thyroid carcinoma: an immunohistochemical study. Am J Clin Pathol. 2006, 125: 399-406. 11. Fluge O, Bruland O, Akslen LA, Lillehaug JR, Varhaug JE Gene expression in poorly differentiated papillary thyroid carcinomas. Thyroid. 2006, 16:161-175. 12. Wiseman SM, Masoudi H, Niblock P, Turbin D, Rajput A, Hay J, Filipenko D, Huntsman D, Gilks B. Derangement of the Ecadherin/catetin complex is involved in transformation of differentiated to anaplastic thyroid carcinoma. Am J Surg. 2006, 191:581-587. 13. Herman JG, Graff JR, Myohanen S, Nelkin BD, Baylin SB. Methylation-specific PCR: A novel assays for methylation status of CpG islands. Procl Natl Acad Sci. 1996, 93:9821- 9826. 14. Mackenzie EJ, Mortimer RH. Thyroid nodules and thyroid cancer. Med J Aust. 2004, 180:242-247. 15. Werga P, Wallin G, Skoog L, Hamberger B. Expanding role of fineneedle aspiration cytology in thyroid diagnosis and management. World J Surg. 2000, 24:907-912. 16. Matias-Guiu X, Cuatrecasas M, Musulen E, Prat J. p53 expression in anaplastic carcinomas arising from thyroid papillary carcinomas. J Clin Pathol. 1994, 47:337-339. 1. Residência Médica MD. Médico do Serviço de Oncologia Clínica HSL-PUCRS. 2. MD, PhD. Cirurgião de Cabeça e Pescoço do Hospital Sírio Libanês. 3. PhD. Membro do Laboratório de Genética Molecular do Hospital Sírio Libanês. 4. MS. Membro do Laboratório de Genética Molecular do Hospital Sírio Libanês. 5. MD, PhD. Chefe do Serviço de Oncologia Clínica do Hospital São Lucas da PUCRS. Instituição: Hospital São Lucas - PUCRS. Porto Alegre / RS - Brasil. Artigo recebido em 25 de março de 2008. Artigo aceito em 1 de julho de 2008.